Although I was born in Vietnam, my parents were originally from Mainland China. As a child, my father would tell us often that our hometown is Tai Po, Quang Dong province. I have a different feeling whenever I go to China than the feeling that I have when I return to Vietnam. My business partner, Rob, & I arrived in Kunming (the City of Spring), Yunnan province, on 30th April for a 2-week inspection trip of Yunnan province, Lhasa in Tibet & a Yangtze River cruise. Our China office director, Tony Deng, welcomed us warmly like long-lost friends, and took us off to check in at the 4* Golden Dragon hotel. It seemed an appropriate place for Dragon Travel to stay. This hotel is centrally located among shops & restaurants. The entrance & reception areas are lively, with displays of local Chinese arts & crafts. The staff are all very friendly & helpful with good spoken English. This is important, as many hotels in China especially in the standard category, do not have English-speaking staff. The room is spacious & bright, with a nice clean bathroom with western toilet facility. The next morning we found that the breakfast has both Chinese & Western foods, display buffet style. This is also important because some hotels only offer Chinese breakfast. 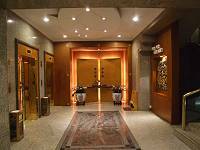 We are happy to offer Golden Dragon as our 4* Superior hotel in Kunming. 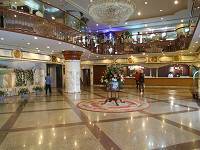 We also inspected another hotel, the 4* Kunming. This is an older hotel built in 1950 as the premier hotel of the time. The lobby is a display of glittery crystal chandeliers & golden floors, walls & ceilings in a very Chinese style. This all changes as soon as you enter the bedroom floors, where it seems to be another hotel. The lift landings & corridors on each floor are softly lit with spotlights & displays of Chinese art & sculpture. The rooms are also beautifully designed with settled colours & dark wood furniture. We will also be using this hotel in our Superior category. We visited our Chinese partners' offices in Kunming. The company has been established in tourism for over 20 years, and is a very professional concern: this matters, as many new travel firms have set up recently to meet the demands of tourism in China and do not have the depth of experience. Next morning we began our short tour of Kunming with its famous Bamboo Temple. 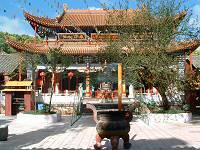 The temple dates back to the Tang dynasty. 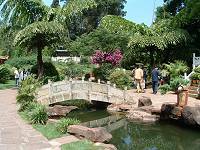 The beautiful Chinese architecture with oriental landscaped garden is beautiful & peaceful. There are two huge clay Chinese God figures standing on both sides of the entrance door. The view of the large courtyard garden is in front of us. Across the courtyard on the other side is the temple resting a few steps upward like heaven. The other intriguing thing in this temple is the collection of hundreds of life size clay figures made by a master Sichuanese sculptor, Li Guangxiu. These figures are displayed in 2 rooms along the entrance to the courtyard. The figures look almost alive imprisoned in their glass cabinets. The Golden Temple, our next port of call, dates back to 1670 & was the summer residence of General Wu Sangui. In contrast to the Bamboo Temple this is a busy temple with many visitors, especially as we visited on first day of May, a Chinese public holiday. The landscaped gardens inside the temple complex are beautifully designed with lakes, bridges & replicas of the Beijing Summer Palace. There are red lanterns hung on trees in the park area making it a perfect Chinese garden. After the two temples visit we caught our late morning flight to the city of Chong Qing.